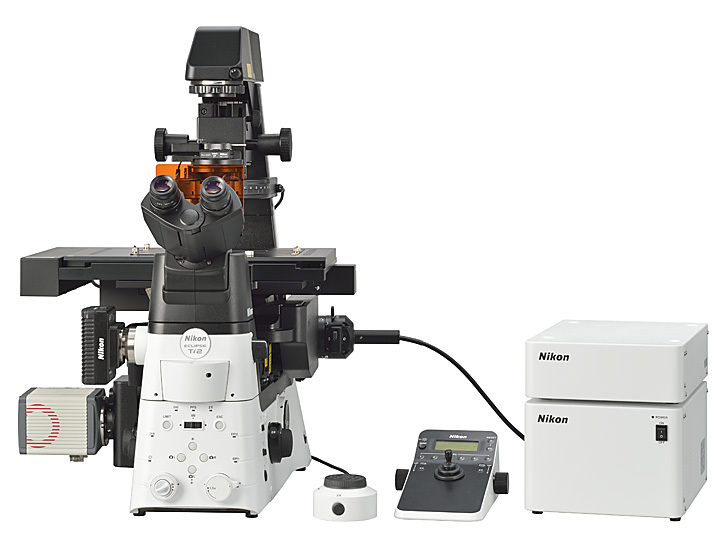 Nikon Corporation (Kazuo Ushida, President, Tokyo) is pleased to announce the release of the ECLIPSE Ti2 Inverted Research Microscope. The new ECLIPSE Ti2 Research Microscope is the successor to the ECLIPSE Ti, which has been highly successful in the inverted research microscope market. Since their release in 2007, Nikon’s inverted research microscopes have gained a strong reputation among universities and laboratories in the medical and biological research fields. The ECLIPSE Ti2 was developed to respond to the growing demand for high-speed acquisition and analysis of large volume images, which are becoming more common in current scientific research as a result of the recent increase in the size of camera sensors and the data processing capabilities of PCs. The ECLIPSE Ti2 also has improved stability thereby providing a superior platform for super resolution imaging and long time-lapse experiments. Integrated sensors and intuitive user interface provide an effortless imaging experience and allows researchers to focus on the their acquired data. The diameter of the observation light path has been enlarged. The ECLIPSE Ti2 has achieved the largest FOV in the inverted microscope market. Integrated fly-eye lens technology ensures uniform illumination of the large FOV, edge-to-edge, enabling high-quality, high-speed, image tiling experiments. The quality of image data is influenced by focus stability, which in turn is greatly affected by even the slightest changes in temperature and vibrations in microscopic environments. The Ti2 can eliminate focus drift during long-term time-lapse imaging by static and dynamic measures, faithfully visualizing the microscopic world. Platform stability has been considerably improved by downsizing and repositioning the focusing mechanism. The newly designed focusing mechanism also eliminates thermal fluctuations, further minimizing drift in XY and Z. Optional accessories such as the Perfect Focus System and Auto Correction Collar* also contribute to the improvement of high quality imaging. *Automated correction collar enables users to easily correct for aberrations induced by changes in temperature, cover glass thickness and non-uniform refractive-index. User experience has been revolutionized with the Ti2’s built-in sensors and internal camera*1 and the Assist Guide, the world’s first*2 intelligent microscope operation guide which integrates all of the status information collected from the sensors to help navigate users through their desired observation method. The Assist Guide also detects and alerts users of errors in microscope setup, eliminating time and energy normally spent on troubleshooting. The Assist Guide can be accessed either through a tablet or PC interface. Furthermore, the Ti2 has been completely redesigned, from the overall body design to the selection and placement of every button and switch, for more intuitive operation.